Who was Phoebe of Cenchrea? Why would Paul write about Phoebe? Tradition holds that it was Phoebe who carried Paul’s letter to the Romans. As was the custom in those days, the letter carrier bore the authority of the one who sent him or her. A usual part of delivering letters was explaining their contents to the recipient and passing on verbal messages from the sender. So Paul must have thought highly of Phoebe to entrust her with the delivery of his letters. Phoebe was a wealthy woman living in Cenchrea. Paul speaks warmly of her, describing her as both minister and a benefactor. Indeed, she was a Christian minister in the church of Cenchreae. She also helped many people, including Paul, by lending her respect and influence in the society of that time. It seems that Phoebe traveled widely for the sake of the Gospel. And, Paul acknowledges her for her leadership and benefaction. The visits on our Footsteps of Paul Cruises and Tours will teach about the spreading of the gospel during this time period. In the Book of Romans, Paul spoke of his desire to be in Jerusalem, personally, when he gave the impoverished brothers the offerings of the Macedonians. Paul wanted to show the brothers in Jerusalem that both Jew and Gentile were in the family of God. The wealthy Corinthians had just been reprimanded for not taking care of the saints and Paul taught how others had to step in for them. In addition, he pointed out how wealthy saints, like Phoebe, were such a blessing to the delivery of the gospel. It is said she carried the Book of Romans itself in the folds of her cape to Paul when he set sail to Rome for Jerusalem. As we learned later, Paul was held at Rome. At the beach at Cenchrea, we will have a lively conversation on Paul taking on the Nazarite vow, why they chose this location and why the Nazirite vow of cutting his hair. 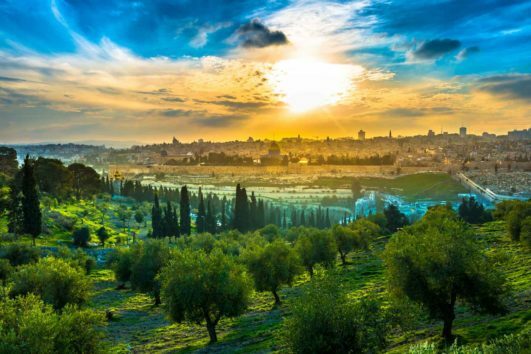 Our 9 and 12 day Bible tours offer a wealth of unique visits. Interested in a religious cruise? Living Passages will have more available Christian cruises soon! You can find your ideal 2017 Christian tour with Living Passages & begin planning for an unforgettable experience! You may be interested in a Christian tour of Europe that we offer in 2017.